To transmit the benefits of the Bournemouth University lifestyle, and the culture of openness and collaboration it fosters, we designed a university exhibition stand that is as unique and welcoming as our client. Bournemouth University (BU) prides itself in its location: between one of the the newest national parks in the UK, stunning beaches and the largest natural harbour in the country. Bournemouth is also home to many corporate headquarters, as well as having the largest concentration of language schools outside the capital. The University is currently going through one of the most exciting and challenging periods in its history. Their journey is focused on their new vision: a Fusion of excellent education, research and professional practice. This new vision aims to establish the University as world class centre, a learning community that reaches beyond borders and combines Creating, Sharing and Inspiring to deliver a unique experience for students. Our client required an exhibition stand that maximised what the University has to offer: a stunning, fresh, and vibrant location and a set of values focused on openness and collaboration to reach excellence. All within some strict budget guidelines. The creative solution we provided is a cost-effective yet visually stimulating university exhibition stand that draws in students immediately, thanks to the vibrancy of the colours and an image that speaks for itself, perfectly getting across the benefits of the Bournemouth University lifestyle. We built the stand in a way that can be easily adapted to different sizes depending on the plot available: by simply adding or taking off panels the stand size can range from 6x2m, 4x2m, or 3x2m, without the design losing impact. The sand-like floor on the modular stand tempts students in to find out more. We opted for a jigsaw foam flooring surface which our client themselves – following training by our team – could also tailor to different plot sizes, maximising BU’s investment. Colour gradation on warm evocative tones and a powerful message on a sun-like shape transmit the singularities of what’s on offer, both on and off campus. 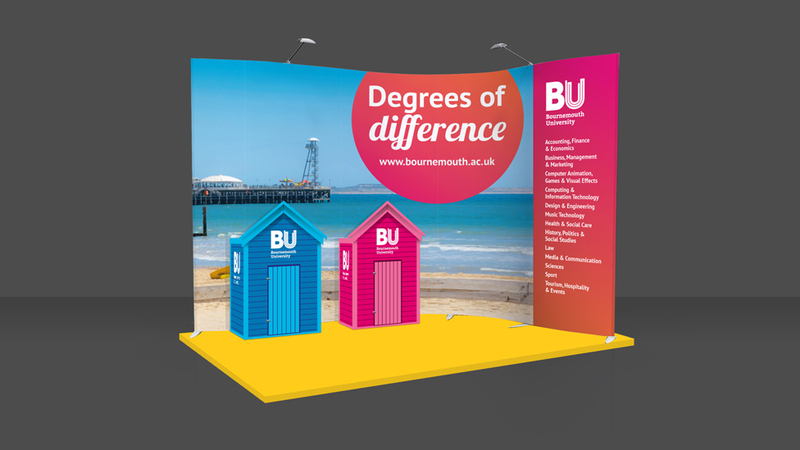 Inspired by the location and the unique Bournemouth University experience, we also included two ‘beach huts’ that not only acted as an intriguing draw for passers-by, but also as storage units for the University prospectus. We also produced a set of simple yet effective pull-up banners.